Most people call their blue point Himalayans "Lilac Points". True lilac points are very rare. There is a visible difference between blue points and lilac pointed cats and kittens. 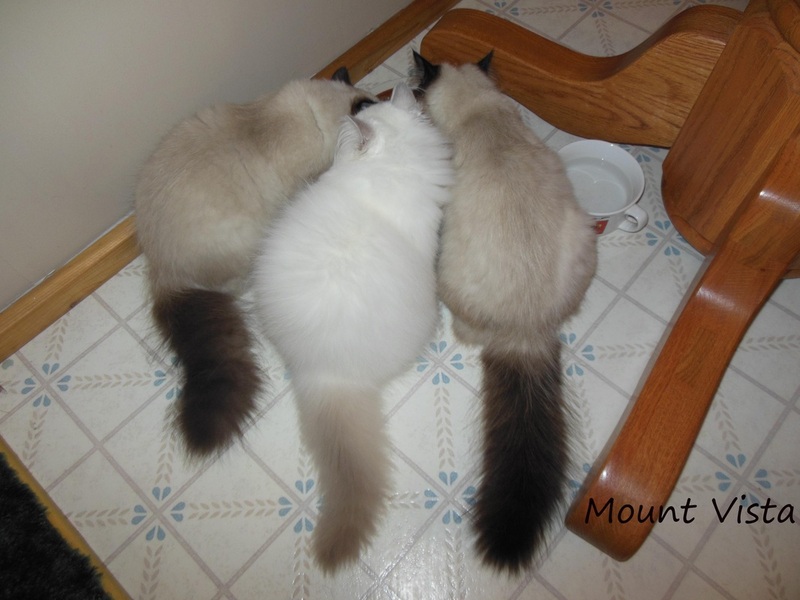 In the picture to the left you will see a true lilac point Himalayan between two seal point Himalayan cats. Click on the picture to enlarge. Blue point Himalayans are so beautiful. They have soft gray ears, tail, feet and face mask. Their main body is lighter than the seal point Himalayans. Now let's talk about the lilac point Himalayan. Their main body color stays a glacier white in color. The ears, tail, feet, and face mask are lavender/pink in color. They are considered rare due to their recessive gene. The leather on the lilac points nose and the pads of their feet stay a pink color. The leather on the blue points nose and pads on their feet are gray. I LOVE my lilac point Himalayan, Isaac. Lilac pointed Himalayans are breathtaking and among the most beautiful of all cat colors. They rank high on my list of favorites. Pictured below is one of Isaac's kittens...a doll faced lilac point girl, who now lives in Oklahoma. (Isaac) Lilac point male at 5 months old.